Fang was born in the 70s. He is a native of Hui Lai county, Guangdong province. Fang was graduated from the Guangzhou Art Academy and specialized in traditional Chinese ink wash painting. From 2005 to 2007, Fang carried on his research study at the Traditional Chinese Painting Department of Guangzhou Art Academy. Currently, he is a professor at the Guangdong Data Engineering College. 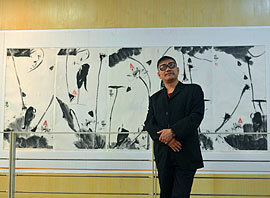 Fang is a member of the Guangdong Artists Union and had participated in many art exhibitions in the country. Fang is also an art writer and columnist for many local and regional newspapers and publications.